How to setup weekly or biweekly payments in Margill Loan Manager? 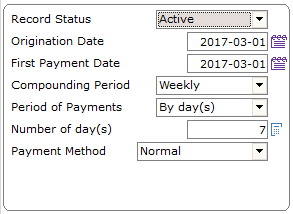 When creating a new record, set up the Period of Payments at ”By day(s)” and input 7 for weekly or 14 for biweekly payments. We also suggest that you setup the Compounding Period to match the Period of Payments. Consult the new User Guide for the Margill Loan Manager – Version 4.3 here.